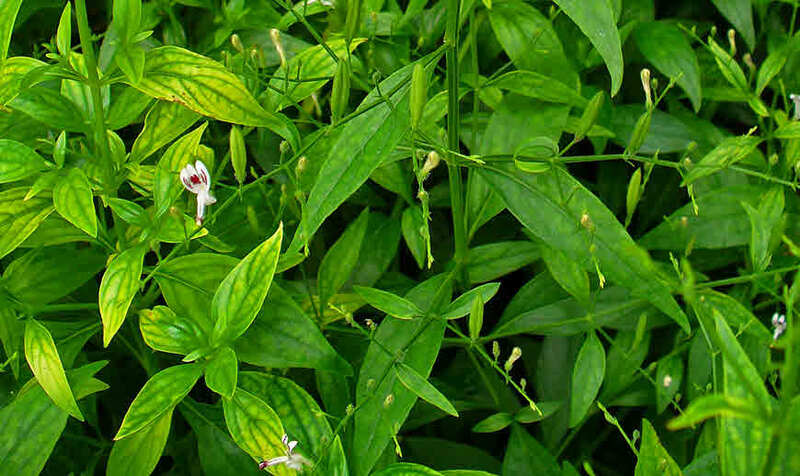 Nilavembu (Nila Vembu, king of bitters, Chirayetah, Andrographis paniculata) is extensively used Siddha, and Ayurvedic herb for treatment of a variety of diseases namely skin diseases, allergy, respiratory infections, ulcerative colitis, rheumatic problems, dengue, chikungunya, fever etc. It has significant blood purifying action, and therefore used in cases of leprosy, gonorrhea, scabies, boils, skin eruptions, and other chronic skin conditions. Nilavembu helps in digestive problems such as griping, irregular bowel habits, and loss of appetite. It is also given in case of general debility, during convalescence after fevers, dyspepsia associated with gaseous distension, and in advanced stages of dysentery. Nilavembu is shown beneficial effects in sore throat, diarrhea, dysentery, cough with thick sputum, carbuncle, sores, and snake bites. Nilavembu works well in innumerable conditions due to its detoxicant, aperient, anti-inflammatory, emollient, astringent, diuretic, emmenagogue, gastric, and the liver tonic, carminative, anthelmintic, and antipyretic properties. It detoxifies the body, and works from within removing the root cause of the disease. It protects the liver, and supports its proper functioning. The aerial parts are Nilavembu Plant, containing a large number of chemical constituents, such as lactones, diterpenoids, diterpene glycosides, flavonoids, and flavonoid glycosides, are most commonly used. The above the ground parts of the plants are used as infusion, decoction, or powder. Such medicinal preparations can be used alone or with other medicines depending on the disease. Nilavembu contains diterpenes, lactones, and flavonoids alkanes, ketones, and aldehydes, and other Phytoconstituents. Nilavembu is a bitter tonic. It is used traditionally for treating fever, the liver problems, jaundice, respiratory illness, and skin diseases. It `is effective in diseases of the liver such as jaundice, slanginess, enlargement of the spleen etc. Nilavembu is used as a preventive, and curative measure for chikungunya, dengue, undetermined fevers, and other viral fevers. Nilavembu is safe, and effective for digestion problems. In the case of chronic constipation, indigestion, abdominal gas, Nilavembu(2 gm), Amla powder (2 gm), mulethi (2 gm) are taken, and boiled to make a decoction by boiling in 400 ml water till water reduces to 100 ml. Filter, and drink. in case of diarrhea, loose motion, abdominal gas, and low appetite the leaves of Nilavembu are cooked in water till it thickens. Then jaggery is added. When it cools down small pills are rolled, and taken. For gripping, irregular stools, and loss of appetite, the expressed juice of the Nilavembu leaves is given the addition of powdered cardamoms, cloves, and cinnamon etc. Nilavembu is effective against fever due to a variety of reasons. It is useful in fever due to its febrifuge, antipyretic, anti-inflammatory, expectorant, depurative, sudorific, anthelmintic, digestive, stomachic, tonic, febrifuge, antiviral, and antiperiodic properties. It is also reported to have some anti-typhoid, and antibiotic activity. Nilavembu Kudineer, which is a combination of Nilavembu with Vettiver, Vilamichai ver, Chukku, Milagu, Korai Kizhangu, Santhanam, Parpadaagam, and Pei pudul, is given in case of mosquito-borne diseases such as malaria, dengue, chikunguniya due to antibacterial, and antiviral properties. Nilavembu is useful in treating the liver related diseases. It exhibits protects the liver from chemicals inside the body, and stimulates the liver. The aqueous extract of Nilavembu leaves is given for jaundice. For treating the liver problems, jaundice, take leaves of Nilavembu (1 gm), Bhumi Amla/Tamalki (1-2 gm powder), Mulethi / Liquorice (2 gm) in 200 ml water. Boil till water reduces to 50 ml. Then filter, and drink. Nilavembu decoction/Kwath or infusion is givens in case of sluggish the liver, indigestion, bowel irregularity, anorexia, abdominal gas, and diarrhea. The infusion of leaves is given in general weakness, and indigestion. Clinical studies done on Nilavembu reports it is safe, and effective for reducing symptoms of cough with thick sputum, uncomplicated upper respiratory tract infections. It is also indicated in the prevention, and treatment of the common cold. Nilavembu has antithrombotic actions. It reduces the formation of blood clots (thrombi). Nilavembu removes toxins from the blood. It is bitter, and detoxifying. Due to significant blood purifying property it works excellent in conditions caused by blood abnormalities such as eczema, burns, skin eruptions, boils, scabies, etc. Nilavembu increases bile flow, and clears the liver infections, and inflammation. It removes sluggishness of the liver after fever. It hot in potency burns ama, improves the liver function, stimulates bile flow, treats the liver-spleen disorders, and bacterial-viral infections. It cleanses the body, improves appetite, and decreases Kapha. All these help in recovery after fever. Adult: 5-10 ml before the meal. Children above the age of 7: half of the adult dose. Frequency: 2 to 3 times a day. Adult: 1-3 grams before the meal with warm water. The person taking oral blood sugar lowering medicines should take this herbal powder under medical supervision. Stop taking 2 weeks before any scheduled surgery. It reduces Pitta, and Kapha but increases Vata. So, Vata Prakriti people need to take it cautiously. No negative drug-herb interactions known. Do not use in pregnancy. It is UNSAFE. Avoid in lactation without consulting doctor. Overdose can cause GI distress, anorexia, and emesis.